Strengthening democracy through Open Government Data Platform! Openness, transparency and accountability are the pillars of any democracy. The more open a government, the stronger is the democratic process. Open Government Data (OGD) platform is a concept that strengthens democracy by opening government information for public use. Digital has catalyzed the idea of OGD and today it is fast becoming a global phenomenon. Governments in many countries are seeking public participation in governance by sharing government data in a proactive manner. India is also a part of this global initiative with its Open Government Data Platform (data.gov.in). It is a Digital India initiative that intends to enhance transparency by proactively publishing shareable government data for public consumption. The data shared on the public platform can be used by the citizens, NGOs, public policy researchers, policy makers, other government departments etc. Our analysis posits that a good OGD platform should meet three important criteria to be effective – it must be backed by policy, it must be comprehensive, and it must be user friendly. This post evaluates OGD platform of India (data.gov.in) on these three criteria. Not all data can be shared openly, it has to be decided based upon clear cut policy guidelines. The OGD platform of the Government of India is guided by the National Data Sharing and Accessibility Policy (NDSAP) which is designed by the Department of Science & Technology. The policy mandates all the Ministries and Departments of Government of India (Union Government) to identify and publish shareable data on the portal. The data can be in the form of datasets, documents, services, tools and applications. The identification process will result into preparation of two lists namely Negative List and Open List. The ‘Negative List’ of a department contains the data which are confidential in nature and would compromise the county’s security if made public. It also includes data that contain personal information. The rest of the data falls into the ‘Open List’. The responsibility of regular release of datasets on the platform lies with Chief Data Officer who acts at the level of Joint Secretary (JS) or above. A ministry or department can just use its discretion on whether a dataset it shareable or not. In addition to the Policy Document (NDSAP), a set of guidelines has been issued to standardize the process. OGD platform of India runs on a clear policy framework. The NDSAP mandates all the ministries and departments of the ‘Government of India’ to publish shareable data on the OGD platform. As of March 2017, there are 104 departments that are publishing data on the platform. Chief Data Officers have been designated in 103 Central departments and 8 states including Karnataka, Arunachal Pradesh, Chhattisgarh, Meghalaya, Tamil Nadu, Haryana and Madhya Pradesh. More than 70,000 data resources have been published into more than 4,000 catalogs. It is the result of the comprehensiveness of the OGD platform that the data resources on it have attracted more than 10 million views and 4 million downloads. The most viewed catalogs the all India pin code directory, state and district-wise scheduled caste and schedule tribe population, all India consumer price index (rural/urban), import export classification, district-wise daily details on Aadhaar enrollment, primary census abstract 2011 – India and States etc. Details are provided at the end of the post. The OGD of India is a user friendly platform. It publishes datasets through an user interface to navigate and access the required dataset. 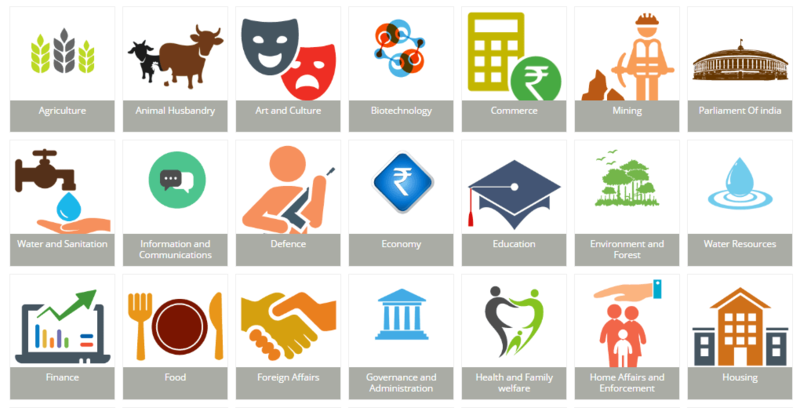 It does so by categorizing the datasets under sectors like economy, agriculture, defense, education etc. A sector may represent an area of interest irrespective of which ministry/ department the data is coming from. One can access the desired catalogs and datasets with least amount of filtering and searching. It makes the task of the user easy as s/he does not need to make an extra effort to find out the relevant ministry or department that publishes the dataset required. Data from various sources can be meaningfully clubbed together through an additional and convenient layer for categorization that enhances ease of access. OGD is a data revolution that intends to empower the citizens of a country, the biggest stakeholders in governance.